Dirk and Dorian E. of the German dream-punk band Seasurfer recount the creation of their exciting new album. Hallo Dirk and Dorian E.! You just released your debut album “Dive In” on Saint Marie Records and it's a stunner that revels in melody and noise in equal measure. What have these past few weeks been like since you dropped your "dream-punk" album? Dirk: Thanks! It’s funny that you use the description "dream punk". For me, it was more about the contrast between the sound of my "dream-pop" band Dark Orange. I was very happy about the large amount of feedback for this album, particularly from the U.S. and UK, because for every musician it's important what the world thinks about an album. However, I have also realized that it is difficult for me and the other band members to experience the album and to celebrate together when our locations are so widely scattered. From what I've read though, you are all natives of Germany. How did you find each other, who is the songwriter of the band, and how did you come up with your intriguing name? 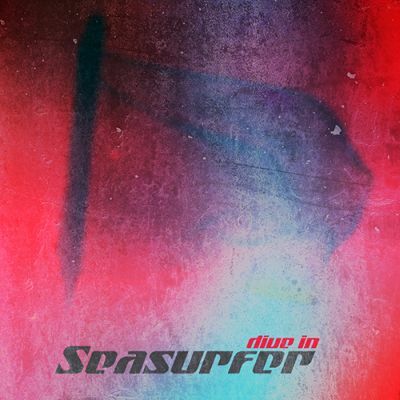 Dirk: I do think of Seasurfer as my band. I wanted to start out with a very specific sound - and I am probably quite a dictator. I make the songs and Dorian adds her vocals to the music. "Seasurfer"... I wanted a simple name, and I live in Hamburg, not far from the sea. Plus, it has something to do with surfing on the sound and in one's own ideas. It fit easily together. I know... It sounds a little like a surf band, but whatever. You've been described as having a "dream-punk" sound, a blend of the punk rock and dream-pop genres. Which artists or creations have helped to shape your sound? Dirk: We are all somehow influenced by the music that we grow up with throughout the years. I experienced the punk and New Wave scene here in Hamburg in the 80's, then later the whole 4AD stuff. Bands that have influenced me: Robin Guthrie, U2's the Edge with the guitars, the power of the old punk heroes like the Ramones, Bad Brains, and Hüsker Dü. And yes ... even Sonic Youth, My Bloody Valentine, and Slowdive. These influences were relevant to the time in which I played in punk bands or later with Dark Orange. I first heard about you while perusing the Saint Marie Records site and listening to your demos. How did you connect with this record label? Dirk: I had been on a German label, but I often listened to the Saint Maire Records Player. I had also read about the label boss, Wyatt, somewhere, and how he founded SMR out of love and idealism. All of those things I really liked, and I sent him a few Seasurfer demos. Two days later, everything was put into motion. I like it when a label has a clear idea and image. Although your album is titled "Dive In" and your band name contains the word "sea", your sonics at times explode and dazzle like ending song "Fireworks". Was it your intent to create a dichotomy between water and fire imagery on the album? Dirk: Hmmm ... I didn’t really notice this. I wanted it to be very emotional within the songs. Full of adrenaline, sometimes exploding, letting it have crashes and whimpers ... Not just make everything smooth. I sent some songs to my parents and they thought their player was out of order because everything is so distorted ... Haha. I spoke to Robin Guthrie about the ending of "Fireworks" because I was not sure if it was too much, and he said it's cool; it fits well. Dorian E., I just love your imperious to emotive, sharply enticing vocals that recall Siouxie Sioux in sound and Peter Murphy in intonation. Are these artists who have influenced your vocal delivery? Dorian: When I was a teenager, I played a demo tape for a friend who asked me that, too. He said my voice and looks totally reminded him of Siouxsie and the Banshees. I had never heard of them at the time and bought a few records. I loved them right away, of course, and I am still a huge fan of Miss Sioux. Peter Murphy? Nice comparison, but I don't think I was really influenced by him. Dirk (and Mikel), you build up such a densely textured sound of scouring, winding, and spiraling guitars. What guitars and/or effects are you using? Dirk: Oh... Time to blab secrets! We made the bass sound, which reminds me of Simon Gallup of The Cure, when mixing in the studio; previously, it was recorded clean. I play the typical Fender Jazzmaster, the Roland Jazz Chorus, plus an old, 19-inch Boss GX 700, and many additional older and newer effect pedals like the Hyper Metal from Boss, the Devi Ever Shoe Gazer, the Memory Man, the MXR Phase 90, and many more. I recorded all the guitars in my own small studio the way they are; that's important for me to catch the ideas and sound of the moment. Sometimes, it all flashes by like a gambling hall in Las Vegas. You mention having a drummer, but he isn't named. Have you gone through a "Spinal Tap"-like turnover of drummers? Is there a permanent person added to your line-up now? Dirk: The drummer, Boris, is not a permanent member, but he is currently part of Seasurfer. I write the songs and work first with his sampled drums; then later on we return to finalize the sound. On the title song, Dorian E., you speak in German. What are you saying on this song? Are the lyrics available anywhere? wasn't a night mechanic playing? isn't he long in the deep? How did you hook up with U.K. producer Karl Skivington? Did you record the album in Germany or England (or elsewhere)? Dirk: I asked Wyatt, of Saint Marie Records, who mastered the Spotlight Kid album and made contact with Karl. Karl is cool and very good. He knew immediately what it is all about, and he didn't smooth the sound. I recorded the songs in my own recording studio in Hamburg and Dorian recorded her vocals in Berlin. I mixed the album with Axel Ermes, who is a good, old friend from the older Hamburg scene. You may know Axel from his work with Wolfsheim, Cassandra Complex, Girls Under Glass, and many more. Your video for "Stay" reminds me of prime shoegazer videos from the likes of My Bloody Valentine, Jesus And Mary Chain, and Lush. Who shot the video and was the color scheme and imagery your idea or the director's? Dirk: We asked Wyatt if he wanted to make a video for "Stay". I believe that, in fact, Wyatt is also an artist. We sent him only a few scenes that we shot with an iPhone. All compliments go to Wyatt - he did everything and it was all his idea.